Originally built by the mother of Emperor Constantine in 330 A.D., the Church of the Holy Sepulcher commemorates the hill of crucifixion and the tomb of Christ’s burial. On grounds of tradition alone, this church is the best candidate for the location of these events. The Garden Tomb was not identified as the tomb of Jesus until the 19th century. The original Byzantine church was destroyed by the Persians in AD 614. Rebuilt shortly thereafter, the Egyptian caliph al-Hakim destroyed the church in 1009 and had the tomb hacked down to bedrock. The Crusaders rebuilt the church and much of what is standing today is from that time period. The ladder in the upper right window has been there since at least 1860, a testimony to rivalries between the church’s factions. Inside the church is a rocky outcropping which is the traditional place where the cross was placed. Archaeological excavations have demonstrated that this site was outside the city but close to one of its gates and thus would have been a good location for a crucifixion. Today this chapel is controlled by the Greek Orthodox Church. This structure preserves the location of Christ’s tomb. Though the cave here was carved away by a Muslim ruler 1000 years ago, a clear history remains that this has been the revered location of the tomb. Al-Hakim’s efforts to destroy the tomb (and Christianity) in 1009 were not the first. Earlier the Roman emperor Hadrian erected a large platform of earth over the whole area for the construction of a temple to Venus. Jerome adds to Eusebius’ statement that a statue of Jupiter was on the site for 180 years (AD 140-320) When Constantine converted the empire to Christianity, he had the pagan temples dismantled, the earth removed and a church built over the spot. The best piece of evidence that the tomb of Jesus was in this area is the fact that other first-century tombs are still preserved inside the church. 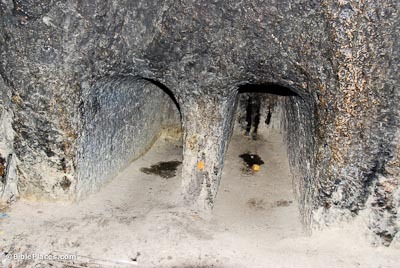 Called the “Tomb of Joseph of Arimathea,” these burial shafts (kokhim) are clearly from the time of Christ’s death and thus attest to some kind of burial ground in the area. Combined with the evidence from tradition, this church is most likely the true location of the Christ’s death and burial. 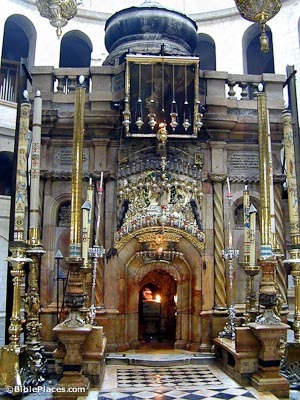 The Holy Sepulchre in Jerusalem (Birzeit University) Provides an extensive chronology of the church and commemorates the inauguration of the rotunda on January 2, 1997. 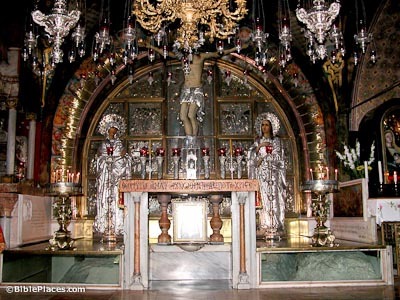 Holy Sepulchre (Christian Travel Study Program) Summarizes the areas within the church laden with traditional meaning. Holds the site to be a reasonable location for the events of the cross based on archaeological findings. Basilica of the Holy Sepulchre (Franciscan Cyberspot) This very extensive site covers the evolving history of the Church of the Holy Sepulchre. Copy of this page at The Holy Sepulchre, also by Franciscan Cyberspot. Church of the Holy Sepulcher (The New Jerusalem Mosaic, Hebrew University) Highlights the construction of the Byzantine church by the Emperor Constantine. The Church of the Holy Sepulcher in the Crusader Period (The New Jerusalem Mosaic, Hebrew University) Tells of the rebuilding of the destroyed church by the Crusaders, the structure which is preserved in the present day building. Holy Sepulcher (Israel Ministry of Foreign Affairs) A description of the famous church in Jerusalem. Church of the Holy Sepulcher a Beehive of Activity (Seattle Post-Intelligencer) Contrasts the cacophony of religious clashes by day with the quiet meditation of clerics and pilgrims by night. 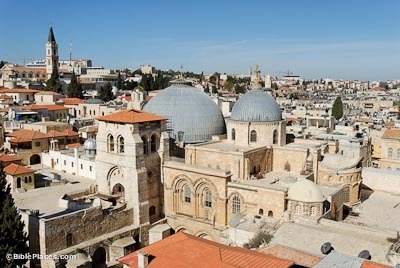 Muslims to Lose Sole Control of Holy Sepulcher Keys (Jewish Virtual Library) A new door to be installed in the church in 1999 required unprecedented unity to be achieved among the various denominations with a presence in the church. 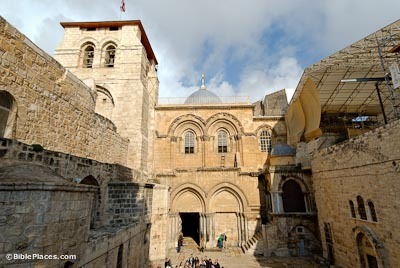 The Church of the Holy Sepulcher (greatmirror.com) Features several unique photographs. Larger images and captions are obtained by clicking on each picture. Holy Sepulchre (Personal Page) Pictures (with captions) of the stations of the cross inside the church. Church of the Holy Sepulchre, Jerusalem (Sacred Destinations) Very informative and accurate page with details on the church’s authenticity and history. 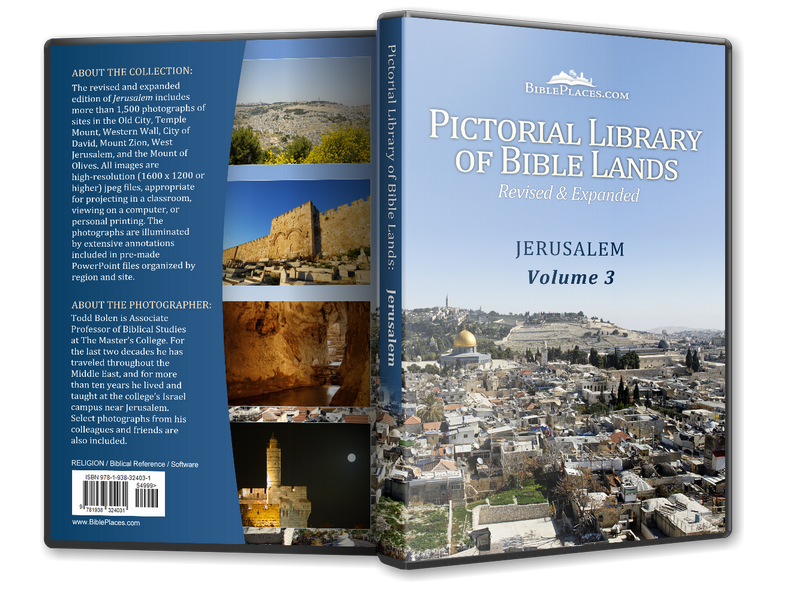 Holy Sepulchre Virtual Tour (3DIsrael.com) Features an extensive tour of the church with 360 degree views.